Aptech Malviya Nagar Institute for English is best-known Institute at Malviya Nagar in the heart of city New Delhi where one can learn highest values of current-day communication from the best and foremost lecturers. Our uniqueness lies in the fact that Aptech Malviya Nagar Institution is not just meant for undergraduates and graduate’s interviewees who want to learn basics essentials of the language in instructors but also for employees who work in private or government profession and want complete command over English language. To get fruitful in your career and social surroundings, you need to speak English well. 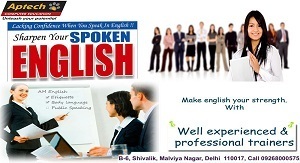 At Aptech Malviya Nagar Association, people of any ages group have learnt how to speak English correctly.